Becoming a separated dad or mum when you’ve been a full-time parent isn’t easy. Trying to adapt from being with them all the time, to limited visits maybe once or twice a week – or even less in some cases – can be heart breaking, for you and for them. It’s at times like this that talking to other parents, or to someone impartial outside your situation, is so important. Jacques Pienaar is the father of a seven-year-old boy. He separated from his son’s mother when their son was two. Until recently he had been denied access to contact or see his son, and had to go to court in order to be granted a contact order. “Coping with not seeing my son was very difficult. I’d been involved in his life since the day he was born, and the longest that I had previously gone without seeing him was 2 weeks. It was devastating, I was constantly on the edge of tears.” Since then, Jacques has been awarded with an interim contact order, and the communication between him and his son has improved considerably. Dominic Wake does not get to see his daughters often, and contact is gradually decreasing. Now that the girls are more grown up (they’re 11 and 14) he feels like he is needed less and less as they become more independent. He said: "When I’m separated from the kids, I try not to think about them. I feel very sad and also angry. I need to see them more and be a part of their life again." In cases like these, it can be an uphill battle trying to gain access to your children. A difficult relationship with their mother will only make matters worse. For the sake of your children, you should endeavour to have a positive relationship with your ex-partner. It will be less stressful for everyone involved, plus it will make it easier to organise and agree on contact arrangements. You might find it hard to act amicably around your child’s mother, and that's understandable, particularly if the relationship didn’t end well. In this situation, it’s a good idea to talk to someone outside the situation. You can talk to one of our Family Support Workers through our confidential helpline on 0808 800 2222. You could also try mediation as a way of improving communication between you and your ex. National Mediation offer free support and resources to families affected by divorce and separation. Let the people who love you help you at this time. In tough times, friends and family want to support you, and opening up and talking about how you feel can put things in perspective. However, the people who are close to you may not always support you in the best way, through no fault of their own. Adrienne Burgess from the Fatherhood Institute says: “Family and friends are good for feeding and housing you and for giving you a helping hand with the children.” However, she says that they are not the people to offload onto. Family and friends are likely to take sides "for a quiet life", and at this time you need someone neutral to talk to, without negativity. Adrienne says: “You’re going to [be able to] move on when you recognised the role you played, not the role your child’s mother played.” Therefore, bad-mouthing your child’s mother, and not admitting that you played a role in the separation, is only going to work against you in the long run. 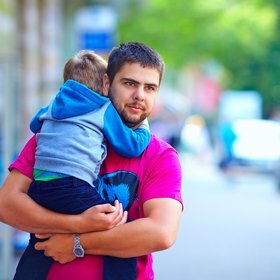 Talking to other Dads who have been through the pain of being separated from their child can give you informed guidance about your circumstances. On discussion forums you can find fathers who can suggest constructive ways to tackle the situation, as they have been there already. Separated father, Sam Wise*, said: "Only people with this experience can talk to other people about it. Even family and friends get fed up, or don’t understand the way this thing can take over your life." Remember to be realistic in your expectations of what those close to you can give you. Family Lives would encourage you to get in touch with us if you need to talk things through first and get some much needed advice. You can talk to one of our Family Support Workers by calling our confidential helpline on 0808 800 2222. Please do not feel isolated with this as we are here for you.